I chose to sail with Windstar to celebrate my 50th Birthday accompanied by both my parents and sister. Below is an honest and unbiased review of what was a very positive experience. 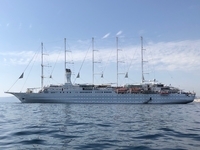 It is obvious on boarding the Wind Surf that she is not just any cruise ship and that Captain Gerry Hogan is very proud her. Quite rightly so. 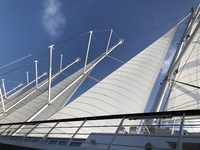 Wind Surf is the flagship of the Windstar fleet and she is a beautiful sailing motor yacht. Captain Hogan is there to welcome his guests onboard and he is there at the end the journey to bid you farewell. It’s a personal touch that sets the tone for a cruise that is truly different. As she sails from destination to destination you’ll feel immersed in the experience, rather than just a passenger travelling upon a ship. The Staterooms might be more functional than they are luxurious, but they are nicely appointed with comfy beds, quality bathroom products and lots of storage space. The Staterooms give you the feel that you are actually on a sailing yacht rather than some grandiose floating hotel. 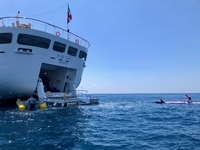 The quality of the food throughout the ship is excellent and there are some lovely dinning options, with two speciality restaurants located on deck and a ship’s BBQ night which none of us will forget! AmphorA is the main dining room. It is sophisticated and elegant with service to match, without being over stuffy. However it is customer service where Wind Surf really excels and without doubt it has to be said, it is second to none! The ship’s crew are beyond outstanding and work tirelessly to ensure your cruise will be an unforgettable one. They have a sense of camaraderie that will make you feel you’re amongst friends and not just there as a paying guest. Windstar deserve every accolade they win. Congratulations! Our thanks go to all the Wind Surf crew for making our trip so memorable. 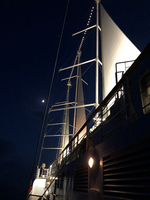 They say Windstar is “180 degrees from ordinary” … “that she will feel like your own sailing yacht.” They are bold claims, but when her sails go up on your last sail away, you’ll know what they mean. Wind Surf … She is is special ship that none of us will forget. I chose to sail with Windstar to celebrate my 50th Birthday accompanied by both my parents and sister. Below is an honest and unbiased review of what was a very positive experience. 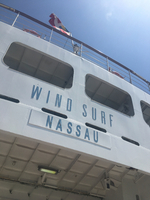 It is obvious on boarding the Wind Surf that she is not just any cruise ship and that Captain Gerry Hogan is very proud her. Quite rightly so. 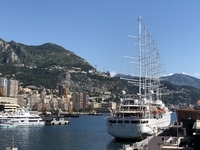 Wind Surf is the flagship of the Windstar fleet and she is a beautiful sailing motor yacht. Captain Hogan is there to welcome his guests onboard and he is there at the end the journey to bid you farewell. It’s a personal touch that sets the tone for a cruise that is truly different. As she sails from destination to destination you’ll feel immersed in the experience, rather than just a passenger travelling upon a ship. The Staterooms might be more functional than they are luxurious, but they are nicely appointed with comfy beds, quality bathroom products and lots of storage space. The Staterooms give you the feel that you are actually on a sailing yacht rather than some grandiose floating hotel. The quality of the food throughout the ship is excellent and there are some lovely dinning options, with two speciality restaurants located on deck and a ship’s BBQ night which none of us will forget! AmphorA is the main dining room. It is sophisticated and elegant with service to match, without being over stuffy. However it is customer service where Wind Surf really excels and without doubt it has to be said, it is second to none! The ship’s crew are beyond outstanding and work tirelessly to ensure your cruise will be an unforgettable one. They have a sense of camaraderie that will make you feel you’re amongst friends and not just there as a paying guest. Windstar deserve every accolade they win. Congratulations! Our thanks go to all the Wind Surf crew for making our trip so memorable. They are bold claims, but when her sails go up on your last sail away, you’ll know what they mean. Wind Surf … She is is special ship that none of us will forget.